Today we find out how to start a mobile DJ business. We'll learn all about the equipment you'll need, how to get gigs, how much you'll earn, and we'll give you some great tips and gear recommendations. 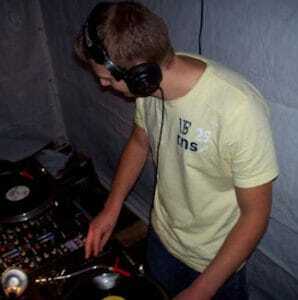 Back in 2008 I was lucky enough to be able to start a mobile DJ business. It started out as a bit of fun with some friends, as you can see in the picture above. But turned into a bigger and more exiting business than I ever could have dreamed. It doesn't take a massive amount of hard work, and if you can get the gigs, you'll make a good living at it. For anyone wanting to know how to start a mobile DJ business, this article has it all! We'll go over the kit, how to set it up, how to start gigging, and what to charge. So the first thing you're going to need to start a mobile DJ business is the equipment. This will be the most expensive part of setting up your business, nobody said it was cheap to start a mobile DJ business... But the good thing is, once you have the kit it will last you for many years to come. It's important that you buy quality reliable kit, some cheaper brands will not last long. But don't worry, I'll give you some great suggestions in this article. The first thing you'll need is something to play the music with. Most mobile DJ's will go with a DJ controller simply because of the convenience they bring. A DJ controller comes with two deck controllers and a mixer all built in as one. Buying a controller rather than 2 separate decks and a mixer will save space, and you'll have less cables to carry around. You will have to take your laptop with you but you can leave your CD case at home. This way you can play music directly from the audio files on your laptop. Deciding on the right controller to start a mobile DJ business can be hard. So I've put an article together which contains a list of the best controllers for all budgets and different skill levels HERE. 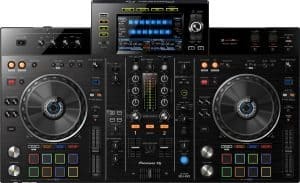 Featured on the list is the Denon DJ MC7000 which is my top choice for anyone wondering how to start a mobile DJ business. The value for money the controller offers is just incredible. And it even comes with the full Serato DJ software that you'll need to use it alongside your computer/laptop. Once again check out the list as there is something for everybody. If you decide to get a different controller on the list, getting the right software is also important, you don't want something that will be laggy or unreliable. The best 2 choices for mobile DJing software are Serato DJ or Native instruments Traktor Pro. You can see my article comparing the two HERE to make your own mind up on which one to choose for your specific needs. Next you'll need a set of speakers. 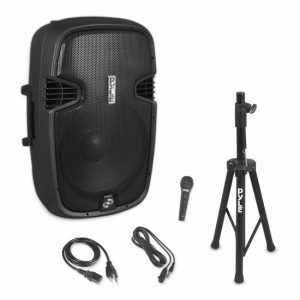 I recommend that you get at least 15" speakers for mobile DJing. Anything less will not fill a decent sized room very well. If you're using an amplifier you'll want passive speakers. But I recommend you get active speakers as there will be less kit to carry around. Active means that the speakers have an amplifier built in so you can just plug them straight into your controller. The Pyle PPHP155ST are fantastic reliable speakers. I've owned a set and they are just perfect for mobile DJing. You can plug in a microphone for karaoke party's. And you can even plug in a USB stick to play tracks without the need to use your controller. They also come with speaker stands, cables, and a microphone. I always use a separate set of monitors which are only used by yourself as the DJ. Monitors are used because the main speakers will be facing away from you and could also be a long way away. You may hear the sound slightly later than what you hear in your headphones. This can be even more of a problem in bigger venues as the sound bounces around the room. If you're just blending tunes this won't matter so much. But if you are mixing and beatmatching your music, monitors are essential. If you're using the previously mentioned Denon DJ MC7000 controller, these will plug into the booth outputs on the back. It has a separate volume control on the mixer section and your main PA speakers will plug into the master outputs. A good set of headphones will be super important. Buying cheap headphones will cost you much more in the long run as they simply don't last. Check out my full buyers guide that also features the best headphones available HERE. And you'll also need to learn how to use DJ headphones correctly, so go here -> show me how to use them. You'll want a set of speaker stands to hold the monitors and main speakers up high. Don't place the main speakers on the floor if they have a hole for a stand. Even though most speakers have a protective grill, many a foot has gone straight through and destroyed woofers and ruined the party. It's also good practice to tuck away cables, or tape them down to prevent people tripping. Just a single trip could destroy speakers and pull your controller or laptop off the desk. You'll also need a good solid desk to put your controller and laptop on. I've always used dedicated DJ tables that fold for easy transport and storage. You can find quite a few different options on sites like Amazon. Make sure you check out the reviews to see what experiences people are having, you don't want anything flimsy that wobbles around as you mix. Next you'll need something to mount your lights on. A simple telescopic stand like the Gorilla lighting stand that I use should be enough for most venues. You can fit 4 lights or a smoke machine on it, and it's very sturdy. Chose your lights wisely. I've found that a moon-flower, a laser, a strobe and a smoke machine are plenty for most venues. Now you have all of the kit to start a mobile DJ business, your sound system should really look the part. If you have never DJ'd before and you need to learn all about mixing first.. Check out my beginners mixing guide here. And if you need help learning how to use your equipment check these out > Using a mixer and > Using a controller/mixing decks. I recommend you get your mixing on point before you start marketing yourself. People will be paying good money for you to put on a great party, mixing keeps that party vibe going. If you can't mix very well or your mixes sound like somebody hammering a nail into the wall, customers won't be happy. Once you have the mixing down you'll really be ready to get out there and start gigging. How do you go about getting your first gig? You need to market yourself in a way that attracts potential customers. You need to price your services right, not to high but not to low. And you need to be clear on the services you will provide. For example, if you're playing at weddings what can people expect from your sets? What playlists do you have? Do you accept special playlist requests? (I recommend you do, as everyone wants something different). 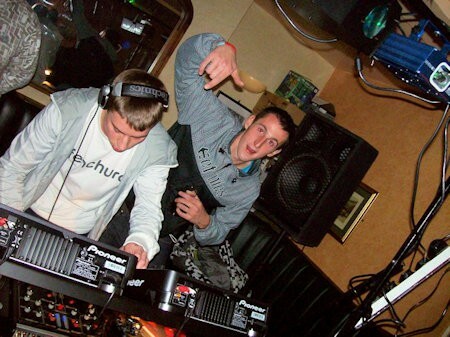 And tell people your previous DJ history, this can give you a lot of social proof and attract more clients. Don't price yourself by the hour. Set a price for about 4 hours, then tell people they can extend the booking for an extra hourly fee. For 4 hours I normally charge about $450 and $65 for each additional hour. You may be able to charge a little extra for weddings as they usually have a higher budget. Don't forget to charge for travel to the venue. You can do the first 25 miles for free, but charge for each additional 10 miles on top of that. Try to cover a wide area, I'll travel up to 500 miles as long as the travel expenses are paid. This way you'll get more work, and make more money per gig. Where to find your customers. When you first start a mobile DJ business nobody will know who you are. And until you've built up a good name for yourself, this will be the tricky part. You could start a website and put an advert in the local paper. Why not start a Facebook page and ask everybody you know to share it! Post flyers through doors, and put them in shop windows. My first few gigs were done as favours for friends but this helped me get a name and recommendations to others. This is how the word is spread, so keep marketing yourself in lots of different ways and eventually you will have loads of work. Another great way to advertise yourself is by recording mixes. Give these mixes out for free around town, or post them to YouTube with a free download link. Then you can get your friends to share it, and you can post them on your Facebook page. Don't forget to put your contact number or web address at the start of the mix so people can find you. Whenever somebody books you work closely with them. Find out what music they like and cater for their exact needs. Ask them to provide a playlist that you can mix in with your own choices. This way you'll find they will be much happier with the music being played. Making people leave happy and singing songs you have played will make them remember you. This way you'll get more work and more recommendations from these people in the future. You can also have some business cards made and leave them on your desk as you play. People will take the cards and keep them in their wallets, this is another way to get more work in the future. When your playing a gig, be careful not to drink any alcohol. This can mess up your set and ruin any future chances of working from these peoples contacts. I've seen many a DJ make a fool of himself because of alcohol, so just drink orange juice. Before you start a mobile DJ business you should check to see if you need to get public liability insurance (US click here UK click here). Some venues will not let you play without it. This may sound petty but if somebody trips over your cables this could cause you a lot of trouble. It's always best to get it just in case, and it's not even that expensive. You should also check with the venue that they have a PPL for UK or ASCAP license if you're in the US. This is a license to play background music. You'll need one if you are charging an entry fee, or if you are playing open air. You may not need one if your playing at a private party, like a wedding. By now you should really have a good understanding of how to start a mobile DJ business, and how it could work for you. Once you have all of your kit you need to set it all up and time how long it takes to get ready. Time how long it takes to pack it all up too. This is something you need to be aware of so that you can have your sound system set up ready before the people start arriving at the venue. The venue owners will also need to know how long it will take to pack up. This is so they know how late they need to employ staff on the day of the party. Knowing things like this and including them on your advertisement will make you come across more professional. Try to answer as many questions on your flyers as possible. The less questions people have to ask or guess for themselves, the better. These are good marketing tactics that will work in your favour. Your presence behind the decks. How is your overall presence behind the decks? This is as important as your mixing skills, you need to be enjoying every minute of it. This sounds like a no brainer right? Maybe so, but I've seen so many DJ's looking bored or fed up behind the decks. This rubs off on the crowd you're playing too. If you look bored or like you're not enjoying it, the crowd will feel the same. But if you're grinning from ear to ear, dancing, and looking like you're having the time of your life, the crowd will get that vibe too. Make a habit of dancing and singing along while you're playing a set. You could even buy yourself a microphone to hype up the crowd even more. Put yourself in the shoes of your audience and think what would make it a better set for them. Anything that gives the crowd a better time is a bonus, and it'll definitely bring you more work over time. And if you're the DJ for a wedding or any type of event where people will be well dressed, try to match their dress code. This will look better in photos and reflect well on you're business. Read my guide on crowd reading here for more tips. Can DJing be a full time job? This is the biggest question people ask when they're wondering how to start a mobile DJ business! You see tons of club DJ's making a living and even getting rich from DJing, but you don't hear about any mobile DJ's making a full time living out of it. Why not? Because they're not celebrities, and don't make the press! Believe me, mobile DJing can be a full time job. Buy the good kit, spend some money on your marketing and always have your customers best interests at heart. You are there to please them by giving them the party of their dreams. Once the party is over, you want to leave them wanting more. Use the many tips in this article and you'll soon see the gigs piling up. Go and start a mobile DJ business!!! So there you have it, you now know how to start a mobile DJ business! The mobile DJ business of your dreams awaits you and your many future customers. Now all you have to do is put everything you have just read in to practice. The next step is up to you, so have fun and keep me posted on how it works out for you. Find out what items you should always pack before a gig HERE. Check out some of the best controllers available to you > HERE. And check out my review of the new great value Pioneer DDJ-1000 controller > HERE.